Very little is known about Annie W. Wiebe. She lived in Neuhorst, Manitoba, but her mailing address was box 56 Gretna. She went to school where she presumably used the scribblers in this collection. She has a brother Jacob W. Wiebe whose name appears on a horse breeders certificate (This also could be her father). Because she lived in Neuhorst, she is most likely from the Reinländer Gemeinde. There are two good possibilities of her family connections. She is likely either Anna Wiebe (1907-), daughter of Wilhelm Wiebe (1871-) and Elisabeth Martens (1875-), or Anna Wiebe (1912-), daughter of Wilhelm Wiebe (1873–1940) and Magaretha Krahn (1875-). 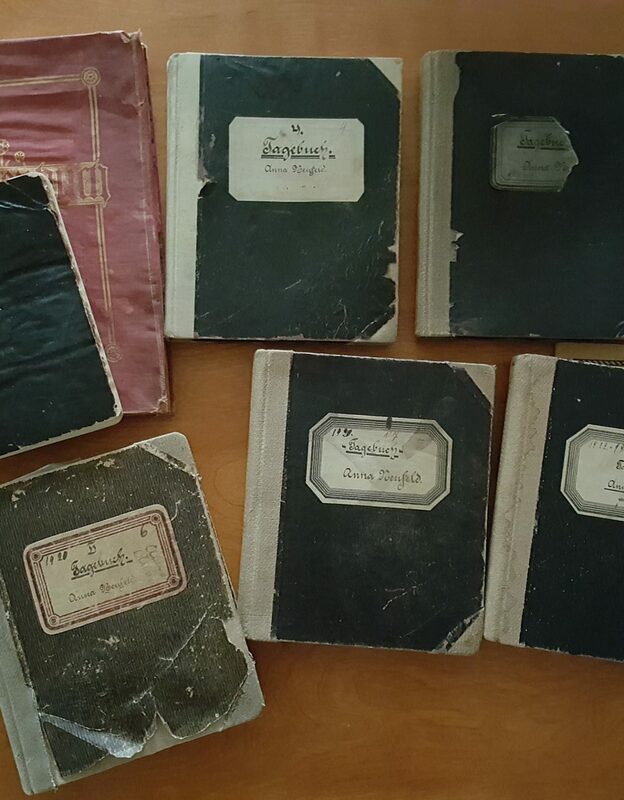 The material in this collection consists of scribblers of penmanship, drawings, and math exercises done by Annie Wiebe, presumably when she was going to school. The scribblers are not all exclusively used for one purpose. Some math exercises were done in scribblers used for penmanship. Other material includes Eatons catalogue, news papers, and calendars. The language of the material is mix with English, German, and Gothic script German. Scribbler of drawings. – [193-?]. The Graphic Drawing Book. – [193-?]. Scribbler of penmanship. – 1931. A. Dollmar, Ein Reines Herz, Germany. – [192-?]. Folder of drawings when Annie was eight years old. – 1927. Kranken Bote, Chicago, Illinois, 1931. Loose pages of scribbler covers and drawings. – [193-?]. Eaton’s Seed Book, Season 1931. Penmanship and math scribbler. – [193-?]. Kranken Bote, Chicago, Illinios, 1937. Rawleigh’s Good Health Products Calendar, 1937. Allgemeiner Illustrierter Katalog über Gute Deutsche Bücher, Winnipeg, Manitoba. – 1928. White Sweet Clover: The Economical All-Purpose Legume Crop, John Deere, USA, [192-?]. Scribbler of drawings. – 1931. Picture of King George and Queen Mary. – [193-?]. Horse breeders certificate and other loose papers. – 1929.